New Caribbean Oil Exploration: has the region already missed the boat? Is the Caribbean sitting on commercially viable oil reserves and what impact would successful finds have on the region? Has the Caribbean already missed the window of opportunity for significant earnings, if the US realises its goal to become an oil exporter itself by 2035? 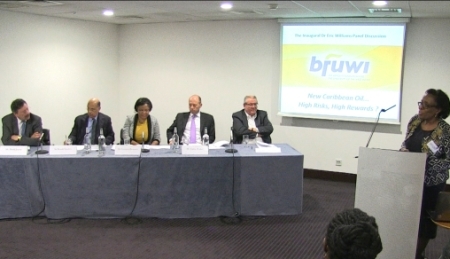 These questions were explored on 22 May at the inaugural British Foundation of the University of the West Indies discussion entitled “New Caribbean oil exploration: high risks, high rewards?” held at the Royal Commonwealth Society. In a spirited debate, moderated by Dr. Veronica Broomes, consultant on sustainability and corporate social responsibility, Halvor Snarvold, Managing Director of London based Caribbean Exploration Limited convinced the sceptics with a map showing areas of the eastern and western Caribbean where oil finds are most likely, due to the geological similarity with West African oilfields. Some of these offshore areas, particularly near Suriname and French Guiana, are currently being explored, while other countries seem wary of granting oil exploration rights due to environmental concerns. Belize has actually halted offshore oil drilling for environmental reasons. • In view of the United States forecast energy self sufficiency from shale gas exploitation, has the region already missed the boat in exploiting its own oil reserves for export markets? • Have individual governments in the region done the due diligence necessary to allow them the confidence to grant oil exploration licences? • Does the region have the collective will to tackle the regulatory, social and political issues a major oil find could raise? • Does the region have the medical, insurance and environmental infrastructure to deal with emergencies that could result from a major oil spill, particularly with regard to protection of coastal assets? • Are the region’s governance structures robust enough to negotiate advantageous royalty or production agreements with multinational oil companies? Is there an appetite for a joint approach to licensing and environmental protection? • Can some of the region’s highly indebted countries attract the international financing needed to conduct oil exploration? • Will multinational oil companies have a positive impact on increasing professional capacity in all aspects of development and production? • Have the relevant countries achieved clarity on territorial sea boundaries? • What is the role for renewable energy, particularly solar, which appears to be an obvious energy source in the sun-rich Caribbean territories? So far, the region has offered no definitive answers to these questions, rendered all the more topical by the uncertainty surrounding the Hugo Chavez initiated Petrocaribe programme, which supplies concessionary oil to most Caribbean countries, except Trinidad and Tobago and Barbados. Significantly, it emerged during the discussion that these questions are not even being debated at a high level within the region itself. As the primary regional grouping, CARICOM would be expected to be in the forefront of this discussion, but is noticeably silent. The British Foundation for the University of the West Indies hopes this discussion will bring these questions into focus within the Caribbean region, stimulate a higher level of debate and act as a call to action for Caribbean leaders. Certainly, the whole issue can be a make or break issue for the region, either ushering in a new area of prosperity or tearing it apart with differing approaches on issues such as economic territorial jurisdictions over offshore oil fields. The British Foundation for the University of the West Indies is a UK registered charity whose mission is to raise the profile of the Caribbean’s premier academic institution, make links with British academic institutions and connect with Caribbean descendants in the UK, who might be enticed by the opportunity to study for a highly respected degree at a fraction of the current costs in the UK. Further information on the debate is available by emailing: admin@thebfuwi.org or dedwards@thebfuwi.org.